By the end of 1921 the Peace Dollar had began production at the US Mint and ran until 1928, then again in 1934 & 35. This dollar was to be a coin that commemorated the end of WWI that raged in Europe from 1914 to 1918. To obtain designs for the coin, the federal Commission of Fine Arts set up a competition involving a small group of the nation's finest medalists. Among them were Hermon A. MacNeil, Victor D. Brenner and Adolph A. Weinman all of which had previously designed US coins. In the end the winner was a young Italian immigrant named Anthony de Francisci. He modeled the portrait of liberty after his young wife Teresa. 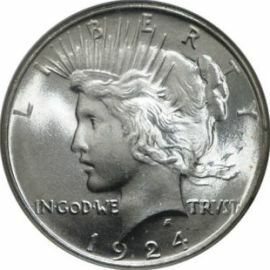 The obverse of this silver dollar shows a portrait of Miss Liberty facing left. The coin also bears the inscriptions of "LIBERTY", "IN GOD WE TRVST" and the date. 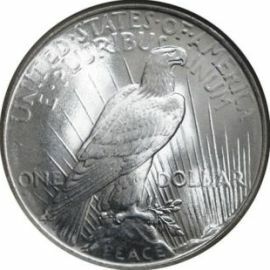 The reverse of the coin shows an eagle perched on a rock superimposed with the word "PEACE". It has inscriptions of "UNITED STATES OF AMERICA", "E PLURIBUS UNUM" and the denomination "ONE DOLLAR". Peace silver dollars are the only US coins produced for circulation that have the word "PEACE" as a motto on them. Most coin collectors, at one time or another, have worked on or completed a full set of these dollars. They are relatively inexpensive, and for the most part, common. This series represents a good place for a young numismatist to start in the hobby.